HAIDA TATTOO KIT - Description of kit and the tattoos of the early Haida people. "Haida Tattoo Kit" collected by ethnologist James G. Swan - Queen Charlotte Islands, July 1883. The "Haida Tattoo Kit" was uncovered by Lars Krutak at the National Museum of Natural History's Museum Support Center (MSC), where all objects associated with that museum (which are not on exhibition) are housed. The search had been initiated after a conversation with Vince Hemingson after Vince returned from the 2001 Tattoo Tour of the South Pacific in Samoa and New Zealand. Between 1999 and 2002, Lars Krutak was a repatriation research specialist with the National Museum of the American Indian, Smithsonian Institution and is the Technical Consultant for The Vanishing Tattoo television documentary series. Lars has been published extensively on ethnographic tattooing among the peoples of the high Arctic. Vince had visited New Zealand's National Te Papa Museum in Wellington and was astonished to discover how little was displayed about Maori tattooing. The Te Papa staff, however, was very interested in The Vanishing Tattoo project and was eager to assist the Maoris in any way they could to help with the current tattooing revival going on in New Zealand. A number of Maori ta moko artists were passionate about reviving the ancient Maori cultural practice of facial tattooing with chisels, a form of tattooing that is unique to the Maori. The War Memorial Museum in Auckland in contrast has quite an extensive tattooing display, with an excellent collection of artifacts and traditional tattooing implements from around Polynesia. Similarly, the Samoan National Museum is also bereft of a display of Samoan tattooing. Lars and Vince surmised that within the Smithsonian's vast collection there might be tattooing tools that been collected but had subsequently been overlooked. There was tremendous excitement when Lars discovered what may well be the only surviving Haida Tattoo Kit and "Bundle" of Tattoo Implements in the entire world. "When Lars phoned me with the news of his discovery, I was incredibly excited," says Hemingson. "In my opinion this is a major archaeological and anthropological find. With these tools, the Haida of the Pacific Northwest could accurately re-create a lost cultural tradition, if that was something they were interested in. The actual implements themselves would reveal a tremendous amount about how the tattoos were done. Nothing would make us happier than to be able to assist the Haida in resurrecting the lost tradition of tattooing "
"When Lars came to Vancouver and showed me the pictures," Hemingson said, "I have to admit I was somewhat surprised. I was expecting tattoo implements similar to the Polynesian designs but instead I found myself looking at pictures that showed tools very similar to the traditional Japanese hand-poking instruments." "What was even more exciting," continued Hemingson, "was that Lars said the paint brushes with the tattoo kit still had pigment on them and showed that both black and red pigment had been used. The Haida, the Mocoví and adjacent groups of the Gran Chaco region of South America, and a vanished group, the Neutral Indians on Ontario who used a red pigment comprised of hematite or plant matter (roots) are, to the best of our research knowledge to date, the only indigenous people in the world that created tribal tattoos using any pigment other than black." The Vanishing Tattoo documentary series intends to try and find out what the Haida used for their pigments. A preliminary discussion with Bill McLennan at UBC's world-renowned Museum of Anthropology has already shed some fascinating light on this subject. McLennan says that pigment analysis to date shows that the Haida used magnetite for black pigments and hematite for red pigments. They also used blue-green paint in their traditional art work but did not apparently tattoo in those colors. It will be interesting to see if the black pigment used in tattooing was not lignite (a form of carbon-based coal) as collected and documented by J. G. Swan in 1883, but magnetite instead. The Vanishing Tattoo has spoken with well-known Haida artist Robert Davidson about the possibility of re-creating the traditional Haida tattoos. Art permeated every aspect of life in traditional Northwest Coast Indian cultures -- even the mundane and utilitarian objects of everyday life were decorated. Traditional carving tools were adzes, chisels, knives, and drills with blades of sharpened stone, bone, antler, shell or tooth. When trade with Asian, Europe and the rest of North America became more common, iron and steel quickly replaced bone and stone. Though a carver today may use a chain saw to rough in a design and paint the finished work with enamel house paints, many of the other tools used are not much changed from these traditional ones collected over 100 years ago. 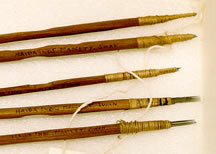 When first seeing photos of the Haida tattooing instruments, (collected by ethnologist James G. Swan in 1883) I was struck by the similarity to Japanese tattooing tools, in particular, the paint brushes. The Japanese used a stick at least a foot long with needles poking straight out, firmly attached to the end with thread. The stick would be grasped at the other end with the right hand, laid across the web of the thumb, and then using this as a fulcrum, jabbed into the skin. The paint brush would be held under the middle joint of the left hand, bristles hovering over the tattoo and offering a fresh supply of pigment for the tattooist to work from. The sticks the North Coast Indians used appear much shorter than the Japanese stick though, perhaps half the length and the needles were in a looser grouping, not flattened out. I surmise the Haida would have held them in their right hand, much as we would hold a spoon, and simply pricked the skin repeatedly using wrist action. I have seen this method used in markets in the South Seas and Asia. The loose grouping of the needles would explain the extremely thick lines evident in the Swan photographs from the 1870's. I had assumed at first glance they would have used the paint brushes in the same manner as the Japanese but I remember reading passages in Swan's writings where the pigment would be drawn on the skin and pricked in after, followed by more pigment rubbed in. This is where the brushes would most likely have been used. Now at first this may not sound feasible, but it certainly would work. If, for instance I tattooed a small yellow sun on the skin and then tried to tattoo in some blue background between the rays, simply smearing that blue as I wiped the tattoo would force enough pigment into the fresh wound to give the yellow a greenish hue. The particle size of black tends to be relatively smaller, particularly if it is carbon based, (contemporary blacks are in the one to three micron range), and would be even easier to force under the epidermis. Our knowledge of Haida tattooing kits has been extremely limited until recently. As part of my many conversations with Vince Hemingson of The Vanishing Tattoo, I decided to investigate the possibility that a tattoo kit existed in a museum collection somewhere: dusty, unused, and lost to time. Luckily, with some persistence and investigative research, I uncovered at the Smithsonian what truly seems to represent the last authentic Haida tattoo kit remaining in the world. 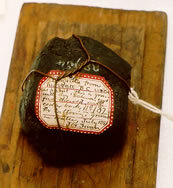 It was collected by ethnologist James G. Swan at Massett, Queen Charlotte Islands, July 1883. Swan authored several Haida tattoo articles for the U.S. National Museum in the late 19th century, including the illustrated "Tattoo Marks of the Haida Indians of Queen Charlotte Islands, B.C., and the Prince of Wales Archipelago, Alaska," among others. Haida tattooing seemed to be quite rare by 1885. Traditionally, it was performed in conjunction with the potlatch commemorating the completion of a cedar-plank dwelling and its frontal pole. 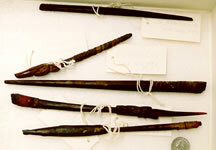 Potlatches entailed the distribution of personal property by the host (house chief) to those who had performed important functions in the actual construction of the house. Each gift elevated the status of the house chief and his family and especially benefited the house owner's children. After the lengthy exchange of goods, each child of the house chief received a new potlatch name and costly tattoo that accorded them high-ranking status. One of the last Haida potlatches that featured tattooing occurred in the winter of 1900-01 in the village of Skidegate. It was witnessed and described by anthropologist John R. Swanton as follows: "[On the second day] they called them to put the tattoo-marks on. At once they painted their faces. Those in the house shouted to the people to come in and look on. When the spectators were all in, they began dancing, and sang property-songs. Those who were to be tattooed began dancing. The wife [of the house chief] stood at the end of the line, wearing a painted hat. When they had sung four songs, they put eagle-feathers on the dancers [for purification]. The house was filled with eagle-feathers. Then they stopped. Those who put the feathers on them were given cloth. When that was over, they had those who were to be tattooed sit down in front of the chiefs. Sometimes two took a fancy to be tattooed by the same [artist]. Now they beat the ground with a baton, mentioned the chief's name, and said, 'So and so sits in front of you to be tattooed.' Then they began to put on the tattoo-marks... All that day they spent in tattooing, and finished it... The nose, lower lip, and ears were also pierced by members of the opposite clan. They were paid a blanket apiece for it." Tattoos depicted the crests of the family and included, for example: land animals (Bear, Wolf, Beaver); sea animals (Killer Whale, Halibut, Shark); birds (Eagle, Hawk, Thunderbird, Owl) as well as geographical features (Mountain, Iceberg); celestial bodies (Sun, Stars, Moon) and natural materials (Copper, Clay, Yellow Cedar). The possession of crests by a family, clan, or house derived from events that the Haida recount in their oral traditions, events that account for their unique identity as a group. Crests explain Haida existence in this world: linking them to creatures or objects in the natural environment and to other clans. Crests also chronicle the origin of supernatural and significant events in the history of the clan. They serve as title to the object on which they are placed and to the site and geographical region where these events occurred. Crests symbolize these special relationships and embody the spirit and being of and in themselves. Thus, the crest, and the right to use it in stories or in tattoo ritual, set the particular group and/or individual apart from other Haida groups while defining their position with respect to each. Therefore, the right to a crest, the right to use the emblem, was more valuable than any object, or human body, that represented it. Traditional Haida tattoos (ki-da) covered the arms, chests, thighs, upper arms, feet, and sometimes an individual's back. A typical kit consisted of a stone dish to mix magnetite (black) and hematite (red) pigments, cedar brushes with crests carved into each handle, and 4 or 5 cedar batons with various configurations of needles depending on the desired effect: shading, outlining, fill, etc. Thomas Lockhart of The Vanishing Tattoo and West Coast Tattoo in Vancouver recently demonstrated that the Haida kit closely resembles that of the Japanese hand-poker. Although Haida tattooing practices are all but dead, the recent resurgence in traditional Haida arts may well foster and provide new life for the ancient custom. With the assistance of renowned Haida carver Robert Davidson and Vince Hemingson of The Vanishing Tattoo, it is our hope to complete the formal arrangements for a temporary loan of the kit from the Smithsonian's National Museum of Natural History to the Haida people themselves. Duplicates could be made and later utilized by interested artists. This effort would offer a permanent and lasting solution to the common legacy and historical roots of Haida communities separated by decades of artificial isolation from their indelible past. "Rediscovered! An Early Haida Tattoo Kit from the Queen Charlotte Islands." Pp. 11-13 in Skin & Ink: The Tattoo Magazine. November 2002.